The weather is breaking into spring-like weather and the baseball season will soon be under way! Yesterday I spent the morning photographing the player portraits for their yearly program. It is always fun to be around the players to sense and hear their excitement and witness their enthusiasm on the brink of a new baseball season. This was one day after try-outs were finished so there was a sense of relief in the air but also a real sense of anticipation as well. These boys are ready to put their game on the field! On a personal note, our son James made the varsity team as a sophomore and we couldn’t be more proud of him! 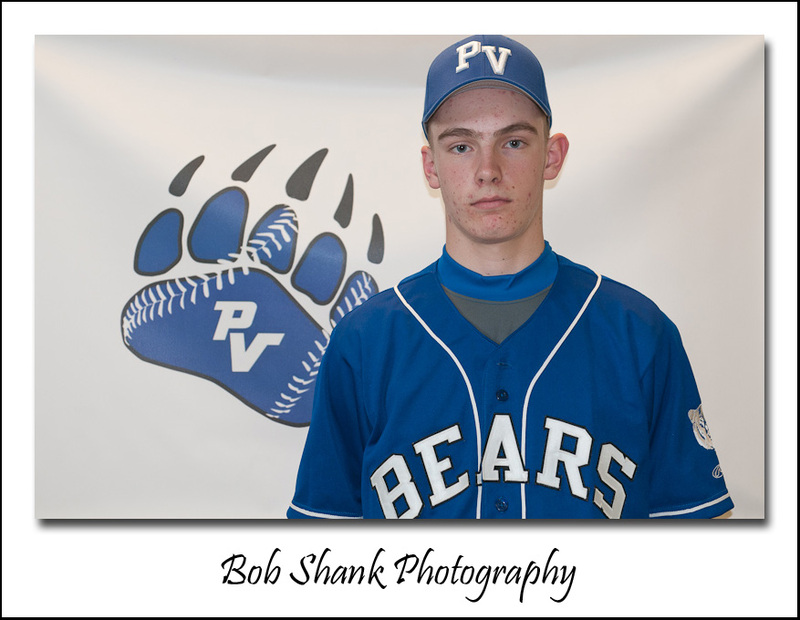 The above photo is James posing for his player profile, which will appear in the baseball program that will be handed out this season.Isn’t that quite a game-face? This year instead of a basic, boring background like a brick wall, I used the team’s newly created logo and made a banner to serve as a backdrop to the player profile photos. A few setup steps in Photoshop and the banner was off to the printer. When it arrived I inserted metal grommets into each corner so I could then attach the banner to my two backdrop stands. I set this up in the locker room, which served as my studio for this shoot. The boys were getting their uniforms for the season, which made this a convenient time for the photos to be taken. I also set up my main light source off to the side of this backdrop at about a 40-degree angle and up high. My SB-900 speedlight was used remotely and I attached it behind an Ezybox to disperse the light over the subjects. This softens the light in a pleasing manner and avoids any hotspots in the photos. I also attached the dome diffuser to further diffuse the light. One test shot and I was ready to go! I really enjoy using Nikon’s off-camera flash setup. It’s quick, easy, and very effective! Once back in my office, it was time to edit the photo shoot. First, I examined each player’s photos and used Lightroom’s Survey View to quickly narrow down the options and pick the best photo. This was repeated for each player on the Varsity and then the Junior Varsity team. Next it was time to do a few adjustments to the photos. I started on the first photo and then synched these edits across the entire collection to apply them to the rest of the photos. Since my setup was controlled and consistent, my sync was also consistent. I like Lightroom for this kind of process, too! Finally, I renamed each photograph with the name and number of each player. This will help the layout guys when assembling the baseball program for printing. Now I am sending all the files to a DVD to send in to the school tomorrow. It’s been a busy weekend but it was fun! The photo shoot went well and I am pleased with the results. I hope the players and their families agree!